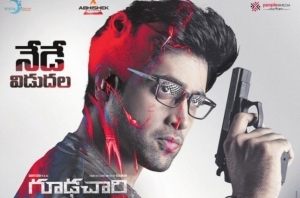 Gopi, alias Arjun (Adivi Sesh), is brought up by his uncle Satya, (Prakash Raj) after the death of his father Raghuveer during a classified mission. Arjun dreams of joining the Indian foreign intelligence agency RAW and serve the country but despite several applications, he doesn’t get any response. So he decides to mention his father’s name under family history with the organization in the application form and gets recruited (through a staged scenario) by “Trinetra”, a wing of Indian protection force,which no one knows exists, that reports directly to the PMO. Satya finds out about this and argues against this decision as he is afraid of losing Gopi but relents. Trinetra’s chief, Damodar(Anish Kuruvilla) briefs his new recruits about their primary target Al-Mujahidin, a terrorist outfit based in several countries and its chief called Rana, whose identity remains unknown despite several attempts. Meanwhile, he starts dating Dr.Sameera Rao (Sobhita Dhulipala) a psychologist graduated from Harvard University and the girl next door. Sameera introduces her uncle as her father. He discovers this and confronts her about this but Sameera confesses that her father died in an accident and she now considers her uncle as her father. Seeing how he’s in a similar situation Gopi confesses about his true identity as well.